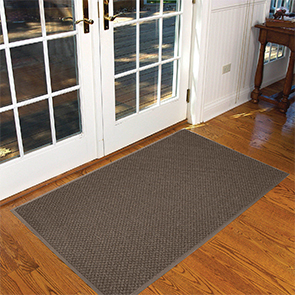 The Preference® entrance mats have a dual fiber surface of scraping and looped pile drying yarns in a mini checked pattern to absorb moisture and scrape dirt and debris from foot traffic. Color combinations blend light and dark colors to help camouflage debris while maintaining its contemporary appearance. A combination of Prelude™ scraping and looped pile Decalon® drying yarns in a mini-checked pattern. Vinyl borders are color-coordinated to match the yarn colors of each mat. Dual-fiber, mini-checked pattern effectively traps debris and moisture while retaining its contemporary appearance.